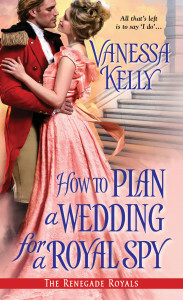 Would you like to get an Advanced Reading Copy of my next Renegade Royals book, How to Plan a Wedding for a Royal Spy? Well, then! Just hop on over to goodreads to enter my giveaway to win one of five copies of the book. Just click here to enter to win! Boy Vanessa, are you Santa?! You are uber sweet with your giveaways!! You’re making lots of readers very happy! I know, I’m one very happy reader of your books! Thanks, Dalila! It’s the giving season!